Stainless Steel Fittings machined fittings CNC machined parts Stainless Steel Pipe Fittings Components S.S. Bar turned components for plumbing and general engineering use, Machined from high quality AISI 304 A2 A4 and AISI /316 material. 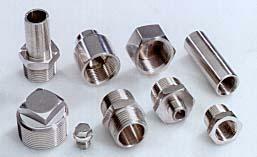 Stainless Steel connectors Plugs etc. Note for Stainless Steel pressed parts components . Pressings and Deep Drawn Components please refer Washers and Pressed Components .